La Dolce Vita - By Guest Writer Tom Sandham ~ Sardinia Baby! If you’re looking to end the dinner with a sweet pay off then these Italian liqueurs will satisfy anyone who didn’t get the necessary sugar rush from desert. The Azzurri have form when it comes to digestifs, but in recent years the herbal, bitter amaros have proved most fashionable in bars. These beverages were largely created for curative purposes in 16th and 17th century monasteries, but, much like Mary Poppins, the monks quickly realised a spoonful of sugar would help the medicine go down. Seeds, nuts and fruits were subsequently added to herbal blends and a range of sweeter liqueurs emerged with many remaining recognisable today in the form of Frangelico, Limoncello and Amaretto. With liqueur production now demanding a minimum sugar content of 100g per litre (or 250g per litre for crème liqueurs and 400g in crème de casis) it’s difficult to champion the ancient medicinal mantras of the monks, but choosing a sweet Italian liqueur can at least cap a culinary themed evening. Perhaps most recognisable amongst the Italians liqueurs is limoncello, once a southern speciality and now globally ubiquitous. Most UK food fans will have been offered the lemon flavoured liquid as a complimentary sip in a restaurant, but this can often be sickly sweet and synthetic in its flavours - after all, they don’t give away the decent gear. Artificial fruit flavours often replicate our perception of taste but compare more commonly to those in a pack of Starburst, so when buying it source limoncello that commits to natural lemon zests in the ingredients. At the dry end of the taste scale is Adnams Limoncello beautifully crafted using the company’s micro distilled vodka as the base. At the sweeter end you’ll find Santa Marta and both are available online. Into the sweet nuts territory, so to speak, you’ll find Frangelico, a brand of hazelnut liqueur that hails from Northern Italy. Sweet and chocolaty the nuts are sourced from the Piedmont region and it boasts additional cocoa and vanilla flavours. The bottle adds novelty value to your digestivo proceedings since its shape reflects a Franciscan Friar, honouring the monks who inspired this style of drink. Sweet and nutty as you might expect it sits well next to or even in an espresso, although espressos before bedtime baffle me. Again you’ll find this one online and shops like Waitrose deliver. As with anything I tend to look beyond the mainstream though, simply because guests always appreciate originality at a dinner party. Nocino offers a nice change of pace and is a walnut liqueur with the sweet start of Frangelico but a pleasant spicy finish and it works brilliantly with cheese or even over ice cream. 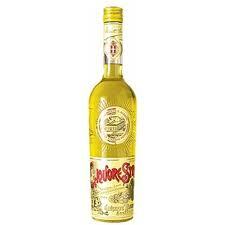 Admittedly this is more difficult to find, although specialist Italian food importers and drinks companies will sell it. Staying with the nuts for a moment you can also add Amaretto to the list. The flavour here comes from bitter almond oil and crushed apricot pips and it tastes similar to marzipan. It’s favourite of my Mum’s no less, and her lasagne is pretty special so I trust her judgment. Best served on ice after the meal you’ll find Disaronno in most supermarkets for under £20. And finally to something with some serious history in the Liquore Strega. This Beneveto beverage might tempt those seeking a little bitter bite with the sweetness and has more minty or coniferous notes. Dating way back to 1860 fans still argue Strega settles the stomach, after all the name means witch, and witches were pretty handy with remedies, so the 70 herbal ingredients including Ceylon cinnamon, Florentine iris and saffron might well do something restorative. If not it certainly makes nice sip with your After Eights. Granted, if you look at Berlusconi it’s difficult to imagine Italians being sweet but this collection of liqueurs adds another important bow to the country’s culinary diversity. With a huge range of flavours to play with this is merely the tip of the sweet liqueur iceberg though and it’s an area worth exploring if you yearn a sugary end to your evening.